Alexander Nevzorov brought Haute Ecole to the new, humane level. Haute Ecole is a French term for high school. It is classical dressage stemming from the cavalry with complex moves by the horse including airs above the ground such as capriole, courbette, and levade. He teaches horses to perform the most difﬁcult elements of Haute Ecole, not only without any constraint, punishment, bridles and bits, that is looked upon as a norm in modern Haute Ecole, but he does all this on a horse that is in a perfect collection. 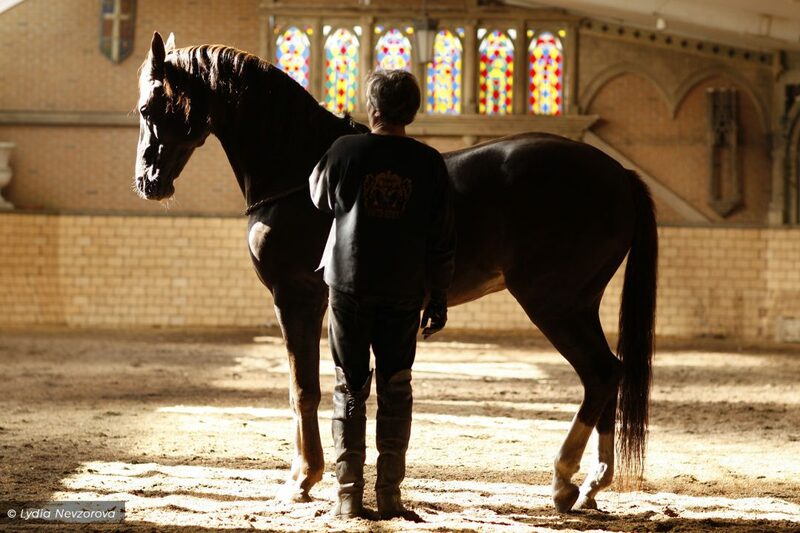 His personal passion is Haute Ecole, yet this same approach can be used by anyone to establish a true relationship with the horse. It encourages us to think. It forces us to change our view of the horse in order to attain what the horse can freely give. It encourages a way of life with the horse. This schooling, or understanding, is not effected through human dominance nor submission of the horse. The goal is to inspire, to enkindle a horse, to awaken its interest and to reveal its full natural potential. It is we who must adapt to the gentle, curious nature of the horse and not the horse that must be subject to our selﬁsh, demanding nature. An excerpt from the prologue reads: I am absolutely sure, this book should not be read or even opened by those who chose equestrian sport, horse racing or driving and so on as their profession or amusement. Sportsmen, jockeys, riders and those who are similar to them will ﬁnd out nothing good from this encyclopaedia. On the contrary. Also it would be better not to have such a public among readers because of their rancour, obstinacy and remarkable aggression that they show when they are trying to defend their right to force and torture horses. At the 39th Worldfest — Houston Independent Film Festival, April 21-30, 2006, the ﬁlm, ‘’Horse Encyclopaedia’’ received the Special Jury Award in the documentary ﬁlm category. The jury not only considered it as an extremely bright work of great talent, but as well the most honest and revolutionary ﬁlm in essence. It previously also won the award at the New York Film Festival. 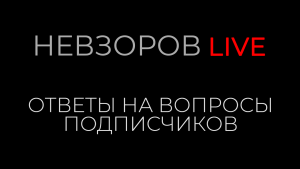 The ﬁlm has already split the horse world of Russia to implacable supporters and furious opponents of Nevzorov. Having been through several wars, Alexander states that, ‘… You can hate violence towards the horse only if you hate violence towards men. Some eight or ten years ago I said deﬁnitely to myself that I would never treat horses as I was taught to anymore. But I didn’t know how to treat them otherwise. So my great emotional necessity to be with them required big and serious knowledge. I start-ed traveling everywhere and studying. I tried to ﬁnd people who could teach me that other manner of treating horses. My wife Lydia played a huge role in all this process, under-standing that it’s impossible to love horses correctly without a proper European education, without some thorough knowledge of hippology. She ﬁnished a college in England and now continues her education acquiring extremely valuable knowledge about horses. Alexander studied with masters of the horse world, yet, regarding the physical control of the horse, he does the opposite of what has been ingrained in us over thousands of years. What eventually became tradition seems to perpetuate the end-less horse problems that many people face today. Through a simple philosophy, you can discover that the solution is not someplace across the country at a 2-day horse clinic, but right in front of you with your own horse. It seems that people need to stop looking elsewhere for answers and start ﬁnding them by simply looking at their horse and thinking. But that case gave me an example of how a horse can change when you stop torturing him. This caused a revolution in my mind. Alexander alternates between teaching and playing with the horse during a schooling session. What he found is that this keeps the horse vibrant, focused, and willing. The horse develops physically and men-tally. The horse learns instead of merely reacting to a painful, physical stimulus, such as a bit, or spur, or whip. The horse is al-lowed to choose to be with you or not. The school’s motto is, ‘The horse is always right’. This can be very difﬁcult for many people to accept, but therein lies the key. This newly gained attention, friendship, and trust from the horse keeps his spirit and character intact, while bringing out his best qualities. ‘At that time I also believed that all this is the evidence of my extraordinary talent. I didn’t understand that it was not my talent that really mattered but my approach and the feeling that I was no longer hiding from horses. From then on I forgot all my previous experience and acted in accordance not with the norms of sportsmen and stunt men but with the feeling I felt for horses. Lydia Nevzorova graduated St. Petersburg Gerzin University (Arts), graduated with honors from College of Equine Studies (Newmarket) and continued studies at Equine Science at Warwickshire College of Equine Study of Harper Adams University, in England. Graduated from the Russian National Open University (Management), she carries out scientiﬁc research under the guidance of Robert Cook, FRCVS, PhD, Professor of Surgery Emeritus of Tufts University, Massachusetts, Yury Tkatchenko, PhD, Professor of Human Medicine (bio-technology). She is the author of a great number of magazine articles and is a successful, published horse photographer and member of the International Horse Photographers Association — IHPA. She founded the Horse Revolution in Russia to inform and educate people about the everyday abuse and suffering that horses endure for the sake of sport or through common ignorance, and is also Chief Editor of Nevzorov Haute Ecole Magazine. She schools horses by Nevzorov’s method, without bits, bridles, halters and any other artiﬁcial aids. She also created the website and online school, and international forum for anyone who has reached a point of understanding to go beyond the norm, or for those who already have an understanding and immediately reject standard horse training based on physically induced pain. There have been individuals throughout history and in our own lifetime that recognize the true spirit of the horse. Yet, in the past, when horses were an absolute requirement for daily survival and advancement of mankind, force was preferred. There has been an improvement regarding the lessening degree of physical violence, but when I look around me, despite the catch phrases of ‘partnership’, ‘bonding’, ‘relationship’, what I still see is an attitude toward the horse of … ‘do it — or else’. In many cases, the term ‘natural’ does not necessarily mean not coerced. Often, the horse still has no choice. With the establishment of a center north of St. Petersburg, Russia, for horse rehabilitation and training for horses, people have begun to learn the true essence of the physical and mental well-being of the horse. After the diverse, usual search for answers, I did not jump on any popular training bandwag-on. Alexander and Lydia chose me to represent them in North America according to my past experiences and progressive life with my horses. I give guidance to those willing to learn in their English online school and am moderator for the international forum. I give private clinics and lessons according to their philosophy and understanding. Seeing their drive and conviction which, literally, has caused a revolution in their own country, I chose to spread the word by making the ﬁlm available in North America and through my website, and by providing information seminars. With all the different horse trainers out there, it is surprising that people are still looking for a better way. Or is it? Another reason is that this is not something that you have to buy into. They offered encouragement, support, and knowledge. I had previously felt quite alone on my path. The answers that many ore seeking are quite simple. There are no levels nor packages to reach for or buy over and over. The book is out, the film is out, and now, by popular demand, a new release is out, ‘Nevzorov Haute Ecole Principles’ which explains the general principles of a horse’s education: Collection, Discipline, Lungeing, Cordeo, Touching, Composure. It is not exactly an ABC method. It shows what is possible. The true answers lie within yourself and your horse. If looking at someone else reinforces what you believe your own horse is capable of doing with you, then it is available.